Tony Aless performed and played with a number of well known big bands including Bunny Berigan, Woody Herman’s First Herd and Charlie Spivak. He was also just as prolific with smaller groups including Stan Getz and George Handy, it is therefore surprising that he does not merit a mention in any of the main reference works. 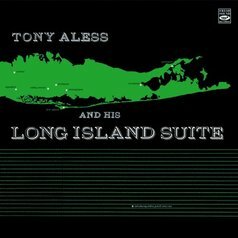 Tony Aless composed and arranged all the pieces on this album, although it comes under the title of the “Long Island Suite” apart from the titles of the eight pieces they do not hang together as a suite but there again not many jazz suites do including Duke Ellington’s. This is the only album by Tony Aless recorded under his own name which is a great pity as he was obviously a talented composer and arranger if we consider the music on this album. This is one of these medium size groups which has the ability to sound like a much bigger aggregation and is entirely due to the skill of the arranger. All the musicians on the album have a wealth of big band experience and are also proficient soloists. The album opens with the up tempo “Levittown” Tony Aless is the first to solo with a more percussive piano style than we have come to expect, there is a fiery trumpet solo from Nick Travis and a laid back tenor solo from Seldon Powell. Don Lamond’s brushwork is immaculate throughout and he tends to be under rated as both a big band and small group drummer. Billy Bauer’s guitar sets the scene for “Fire Island” but it’s Seldon Powell’s rhapsodic tenor which is the focus for this fine ballad except for a short Tony Aless piano solo which rounds out this beauty of the track. All the soloists on this album are of top quality and generate a swing of an high order, Nick Travis plays the kind of brassy crackling trumpet that seems to have disappeared over the years. Dave Schildkraut plays in an alto style that falls somewhere between Charlie Parker and Lee Konitz but melds into a style of his own. Seldon Powell is a tenor player who has a definite style that identifies him and plays with a full bodied tone. The trombonists J. J. Johnson and Kai Winding are team players who enhance the rest of the group. The rhythm section motor along and keep the group swinging driven by the tasteful drumming of Don Lamond. The leader pianist Tony Aless plays better on this album than anything that has been heard previously. This album swings from start to finish and is highly recommended.